With over 20 years in the business, Web.com offers website building, online marketing and web hosting services to small business owners. One look at the Web.com site will show you the most important thing in their approach: they focus on the customer and how Web.com’s experts can help them run their online business better. 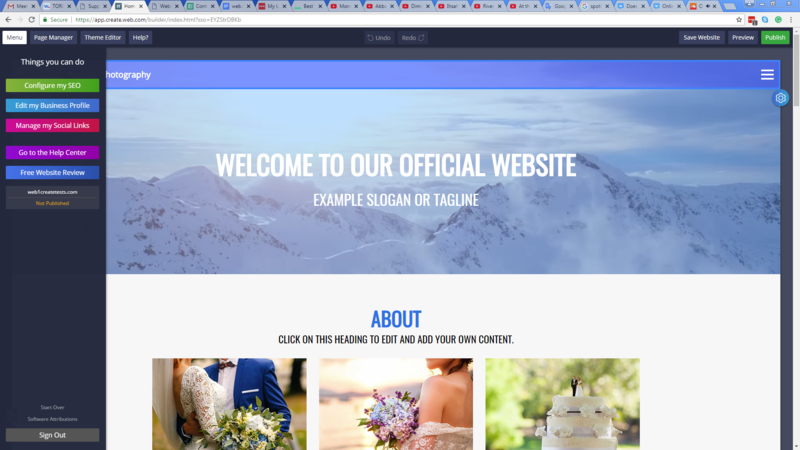 Web.com offers three ways to build your website – do it yourself with their DIY website builder, have their team create a website for you with their ‘Build it for me’ custom plan or have a custom WordPress site built by Web.com’s developers. In addition, Web.com’s support and expert marketing teams are ready to assist their clients with everything from email marketing to social media marketing and local SEO. The following review will focus on the first option – the DIY website builder. Web.com offers you a step-by-step process for selecting your website’s design in which you specify your business field and make design choices from three possible options in every one of those steps. Based on your choices, Web.com creates a site, which you can then further customize from within the site editor. Based on your initial choice of business, your design is generated, with matching visuals. The only way to change the look of the site (the template), would be to go back (using the “start over” option) and restart the setup process from scratch, making different choices at each step. 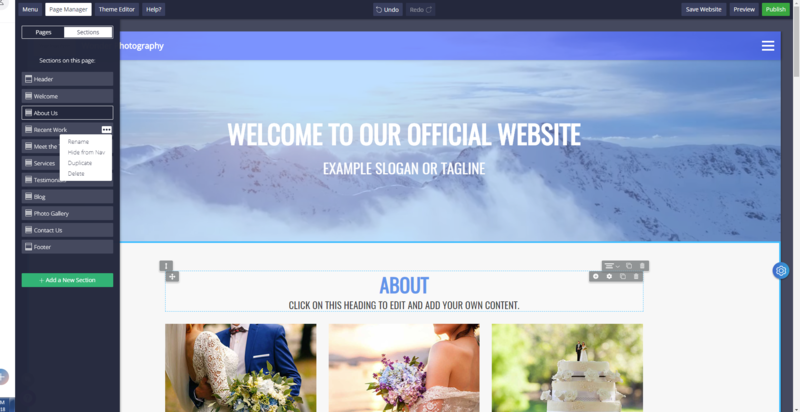 The website design setup process is more restrictive than other website builders such as Wix and Squarespace, who provide the user with a large library of templates to choose from. 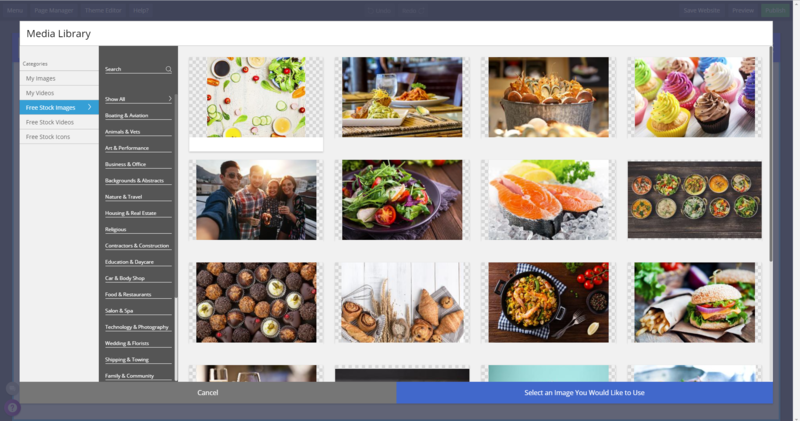 The option to change or upload your own images into your personal image library does exist, and there are plenty of images, videos and icons available, nicely organized into useful categories. If you want to change the header image, it is possible. Want to have a video as a header image instead of a static image? No problem. So even if you can’t actually choose your own template, there are plenty of options to customize the appearance of your website. When your site is generated in its basic form, based on your initial input and choices, you can start editing. There are several options you can use. 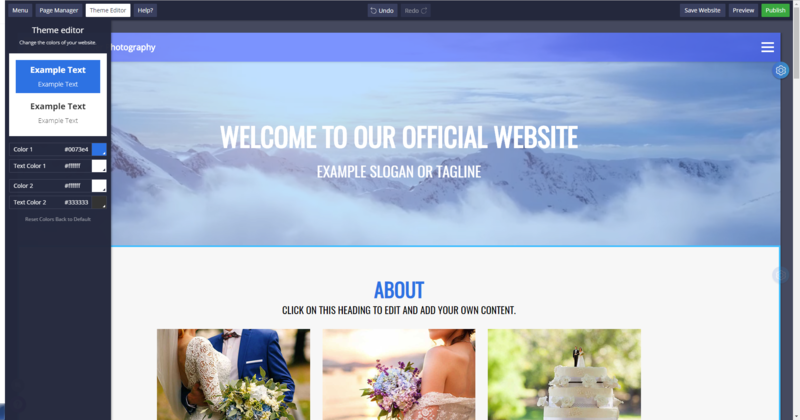 The most basic options, the two primary background colors and the two primary text colors of your website, you can change with the Theme Editor. The Theme Editor does not alter any changes you made in the different sections themselves (using the on-page editing tools). Another option you can use is the Page Manager. This tool can be used for both pages and sections within pages. When using this tool, you first find out your site only has one page so far. If you want to have more pages, you can create them here. The consequence of adding a new page is that your menu will change from showing the different sections that were created in the homepage, to showing the different pages. This may influence your decision to add pages. Luckily, there’s also an option to hide pages and sections from the navigation, so if you only add one additional page (for example to have a separate contact form) you can still have the sections based menu. You can also add and delete sections, or rename them, or hide them from the navigation menu. The Menu button gives an overview of additional edits you can make to your website. Optimize your website for search engines, edit your business profile and manage links to your business’s social media profiles. The “go to the Help Center” option leads you to a section of the site with more info on all the functionalities the DIY Website Builder offers called “Website Builder Support”. This is a very useful section with a lot of info about the website builder and the editing options it offers. The website you build with Web.com’s DIY Website Builder are responsive, which means the site adjusts to the device you’re using. 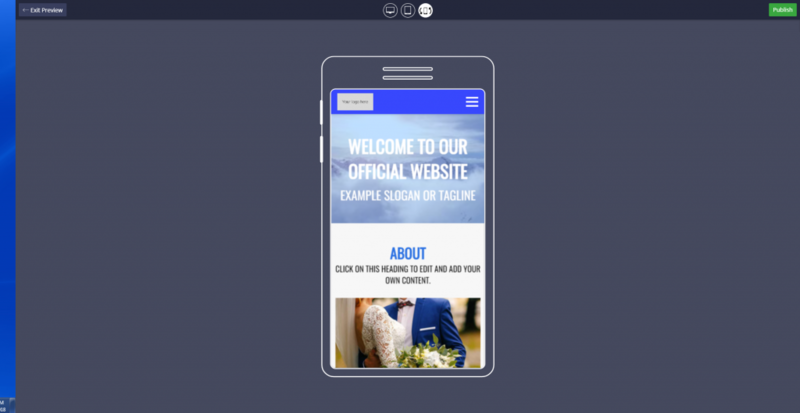 Web.com does not offer a special editor for mobile devices, the way to check what your site looks like on different devices (desktop, tablet, mobile) is by entering the Preview mode and generating the site for each device. For tablets and mobiles, you can check both the landscape and the portrait options. Any changes you make in the editor (which works on desktop layout only), will also be effective on the mobile devices. You can add links to your social media profiles on your Web.com site. The icons that link to each social media platform are placed in the footer of the site. 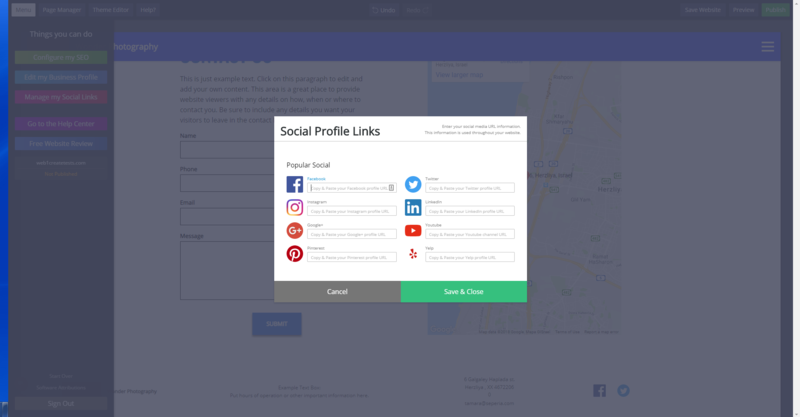 You have the option to add up to eight different social media links, including Facebook, LinkedIn and Twitter. On their company website, Web.com gives site visitors extensive information about the SEO services they offer, emphasizing the importance of SEO and explaining how they will make sure customers will benefit from Web.com’s SEO strategy so that they can easily be found online by potential customers. While this does sound great, the SEO tools that are actually part of the DIY Website Builder are rather basic. 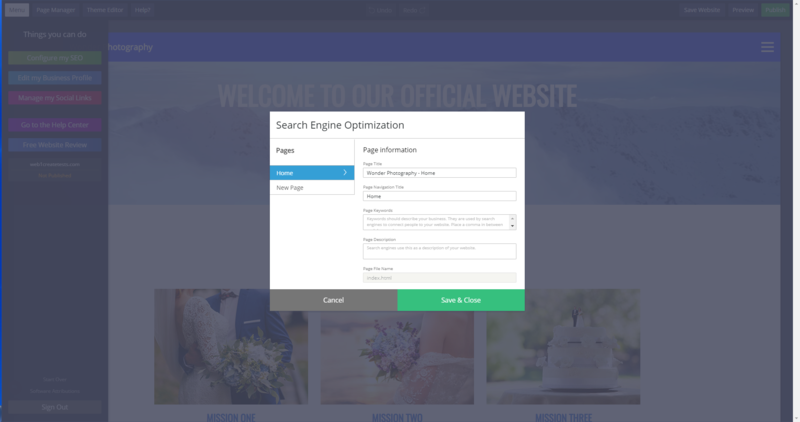 The SEO section of Web.com’s editor allows you to fill in a short form with the Page Title, Page Navigation Title, Page Keywords and Page Description. It could very well be the case that Web.com can supply you with great SEO advice and a fitting SEO setup for your site, but this service is not part of the basic DIY website builder plan. Web.com’s expert SEO consultation is available when purchasing the ‘Website and Online Marketing’ or ‘Website, Marketing and Store’ plans. In the Help Center, site visitors can search for information relating to the many services offered by Web.com. When logged in to your account, there are several ways to get support. 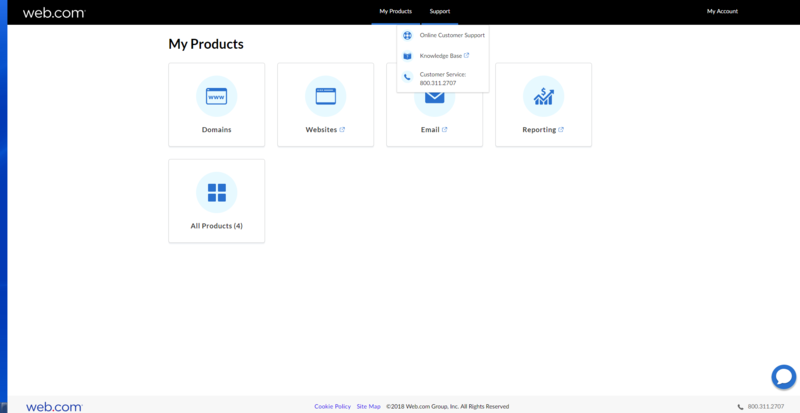 First of all, the Support tab offers a knowledge base, or you can contact the Helpdesk by submitting a support ticket (Online Customer Support), or by calling Customer Service directly (1-866-655-7679). Online Customer Support seems to be available only during office hours. 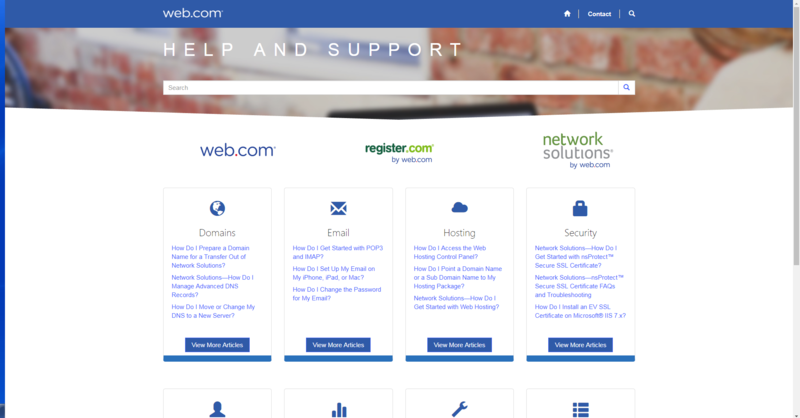 It’s also possible to contact support from within the Website Builder. During office hours, Customer Service is available for chat sessions. 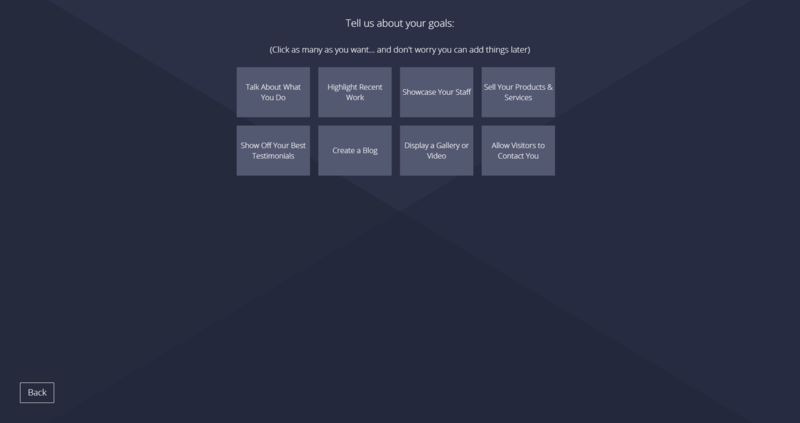 Aside from that, you can click the “Need Help?” option, which will open a little popup box, offering you to check the available interactive guides, which are helpful and take you to the desired information in a step-by-step process. The other option you have in the popup box, is to “Go the the Help Center”, which is the same Help Center as the one offered in the main menu on the left. 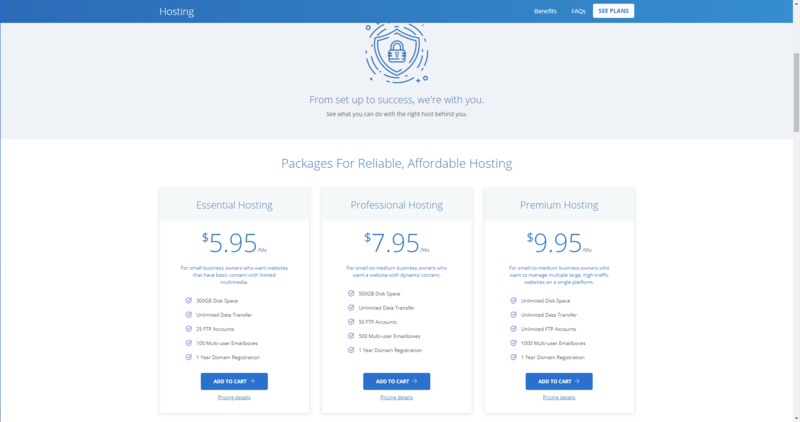 All of Web.com’s DIY plans include free basic hosting, free domain registration for one year and a business email address. After one year, the renewal rate for domain registration is $38 per year. 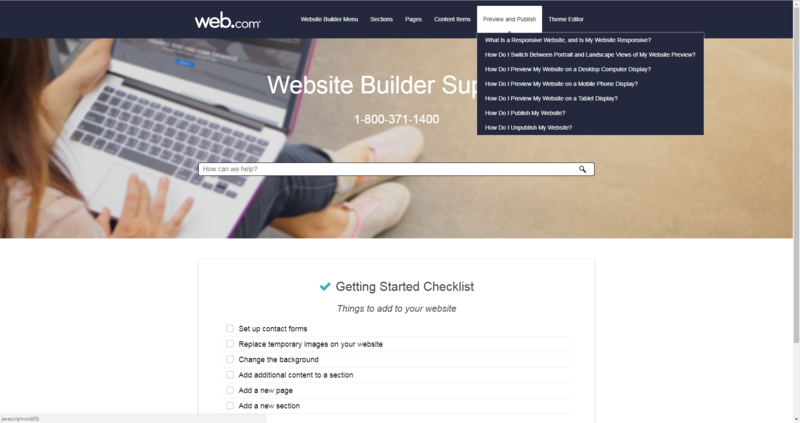 When purchasing the ‘Build It For Me” plan, where Web.com’s experts build your site for you, the plan includes a free domain with domain privacy, hosting with a 99.9% guaranteed uptime and an SSL certificate. Web.com also offers stand-alone hosting plans for users who do not build their site with the DIY builder. Web.com’s offer is simple and consists of three different packages: Essential, Professional and Premium. Each of these three plans contains 1-year free domain registration and unlimited data transfer. The differences between the three options lie in the number of email boxes, ftp accounts and available disk space. In regards to the one-year free domain name, you can opt for a domain with one of the following extensions: .com, .net, .org, .info or name extensions. A .co extension is also available through Web.com, however, it is not free. 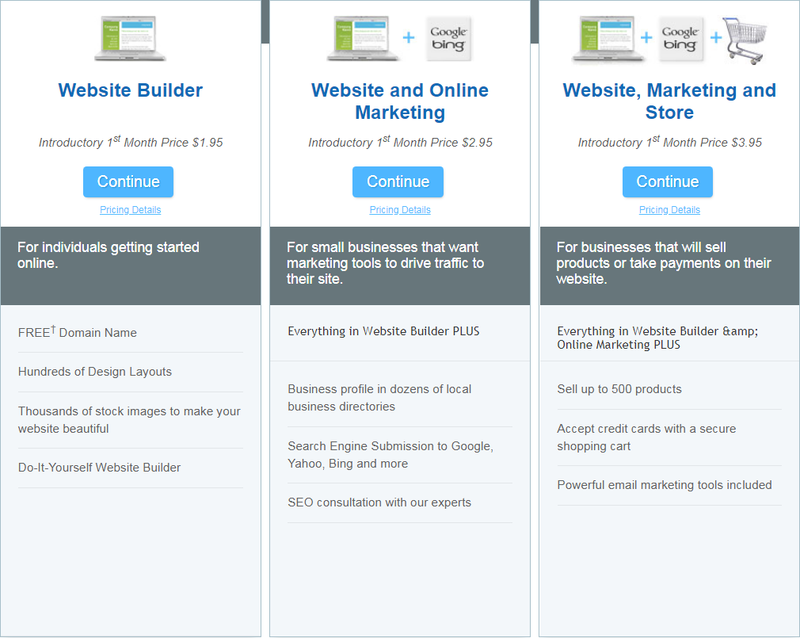 Web.com offers 3 package types for the DIY website builder – ‘Website Builder’, ‘Website and Online Marketing’ and ‘Website, Marketing and Store’. 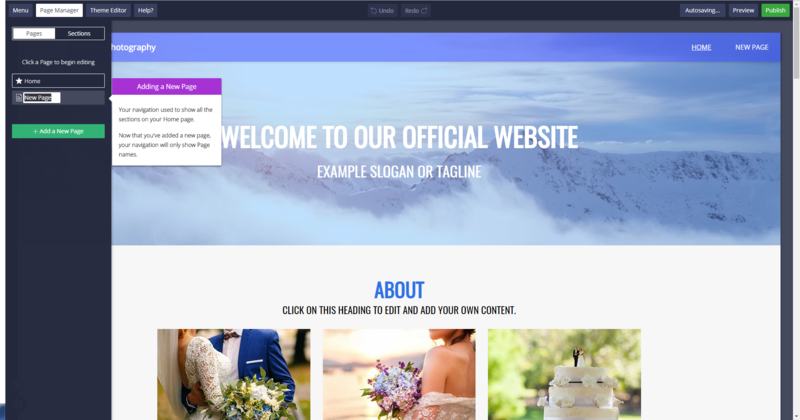 Web.com does not offer a free trial for the DIY website builder, but instead offers an introductory rate for the first month for all three packages. The basic package, ‘Website Builder’ costs $1.95 for the first month, followed by $22.95 per billing cycle. It includes free domain registration for the first year, access to the DIY website builder and thousands of stock images. The ‘Website and Online Marketing’ package ($2.95 for the first month followed by $32.95 per billing cycle) also offers expert online marketing services such as an SEO consultation and submission of your website to local business directories. The ‘Website, Marketing and Store’ package (starting at $3.95 for the first month, followed by $39.95 per billing cycle) is suited to small business owners looking to run an eCommerce business online. This package offers the benefits of the first two packages, plus the ability to sell up to 500 products, access to email marketing tools and a secure shopping cart for online transactions. It should also be noted, Web.com’s billing cycle is every 4 weeks, not every month. You can cancel your account at any time by calling Web.com’s support line. 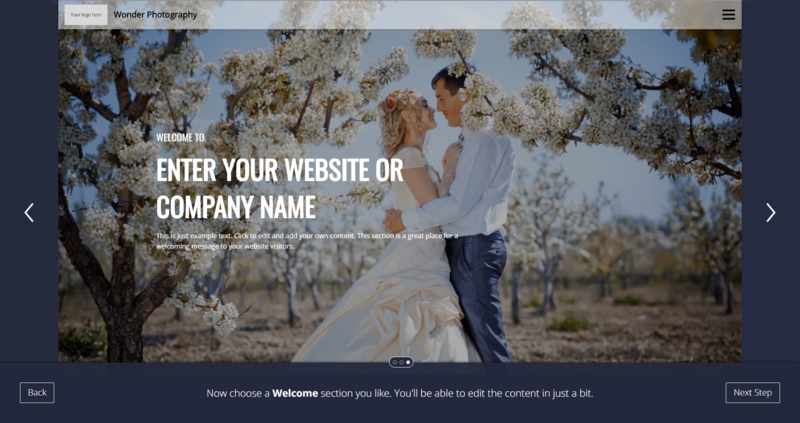 Web.com’s website builder enables you to make many customizations, you can add and delete sections (even if you chose for them to be there in the initial setup), you can change titles, text blocks, add effects – basically everything you’d expect from an editor. As far as SEO options go, the options of the DIY Website Builder are very limited. The Customer Support options are abundant, and the responsive features of the Web.com DIY website builder seem to work very well. 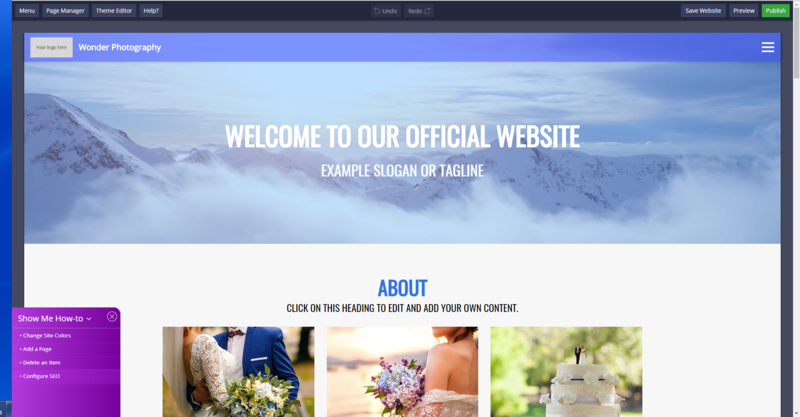 All things considered, Web.com’s DIY website builder is a fairly good option for small business owners looking to build a basic website, especially given the additional support you can receive from Web.com’s experts whilst building and promoting your website. Have Experience With Web.com? Share it!